To celebrate this day of candy consumption (and love), I've doubled down on the content. 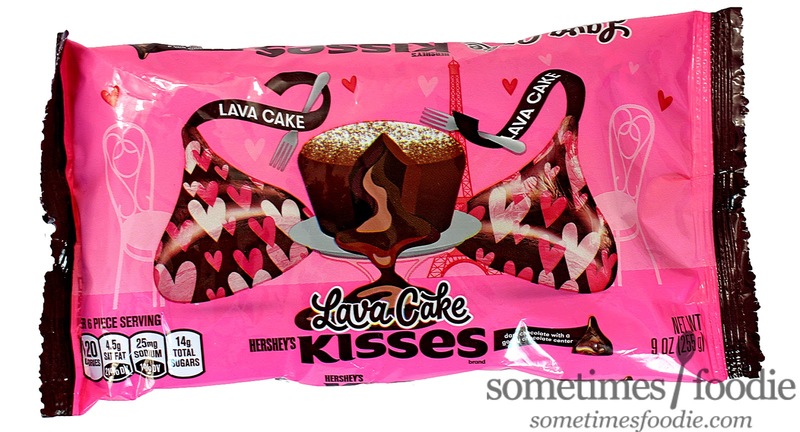 I'll be reviewing the candy as well as the recipe for lava cakes included on the bag. Will this post end up being twice as nice? Or double the disappointment? First, let's briefly discuss the packaging. 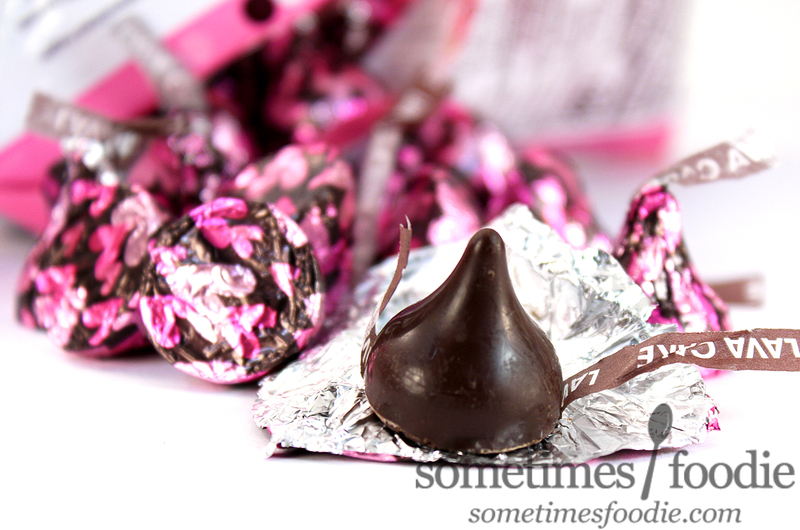 We have the classic, sack-style, plastic bag of foil-wrapped kisses, and it's mighty pink. Seriously, there must be about 10 different hues here, and yet, they all look so similar! The one-note-ness of the pink backdrop teeters on Pepto-territory, but the shades of brown, pops of red, and playful symmetrical layout save the day. These elements ground the design, even though they are seemingly floating against a medicinal pink backdrop, and they make this all the more fun to look at. I dig it! On the back-side, we have the usual suspects: nutritional information, ingredients, and a recipe. These bags of kisses almost always include some kind of recipe or snacking idea, and normally I completely ignore them, but this one piqued my interest. 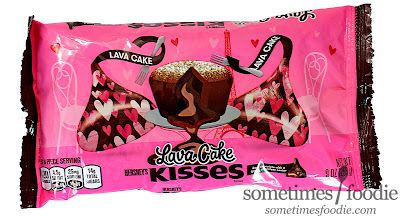 Lava cake Kisses inside an actual lava cake? It's lava-cake-ception! (Still haven't seen the movie, but that won't stop me from making really lame outdated references to it!) But, would that really make a difference? I mean, lava cake is lava cake right? And that recipe doesn't seem contingent on the Kisses. It's more like an add-on. Could they really make all the difference in the end product? We shall see! 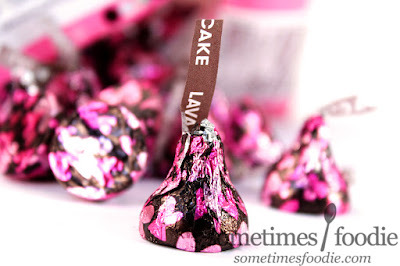 Inside, the Kisses are wrapped with a dark brown foil with pink multi-colored confetti-heart-shapes. There is something so satisfying about unwrapping foil covered candies. It's a textural experience you just can't recreate with plastic. Worth noting! 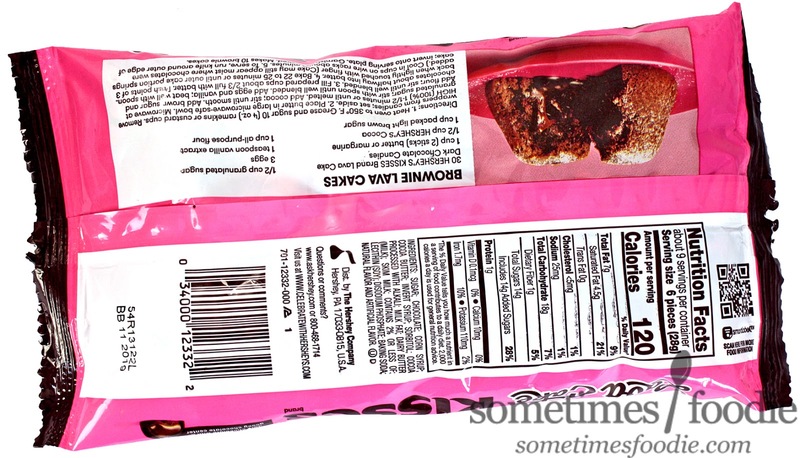 Several of my candies had the paper flag embedded into the bottom of the candy with not way to cleanly remove it. I'll admit, I'm not above eating a tiny bit of paper, but that might be bothersome for some of you fancier foodies out there. 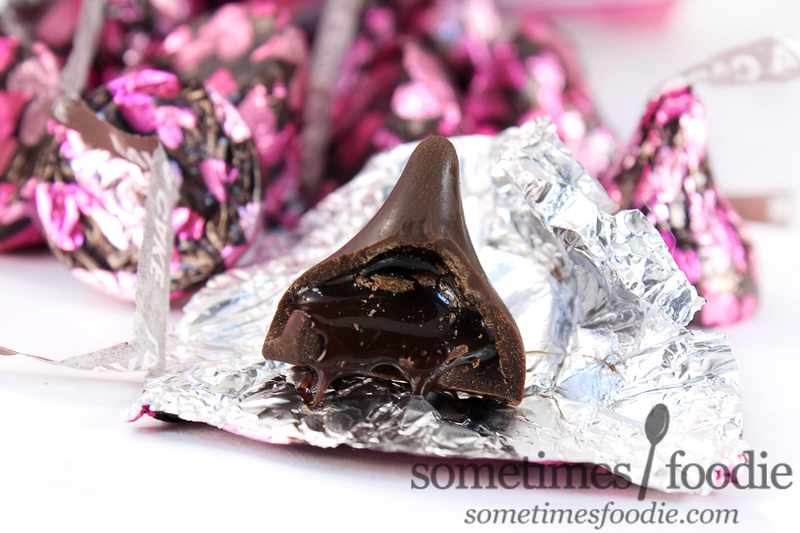 This particular flavor of Kisses used a dark chocolate base, with a "gooey chocolate center." Unwrapped, you can definitely see the difference between this and a classic, milk chocolate, Kiss. This version is darker (duh) and shinier. 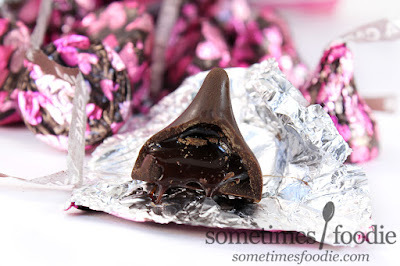 Later, when I was unwrapping these to bake with, I noticed that every once in a while the little chocolate tip would have an indentation that made it look like a tiny chocolate funnel. Is that how they get the filling in? As far as scent, these are much sweeter than most of the dark chocolate I've eaten in the past, but it's certainly less creamy than Hershey's milk chocolate, and it has these oddly refreshing water-y notes that make me think of Hershey's chocolate syrup. Although the base is rather sweet, it's definitely dark chocolate, and it melts nicely on your tongue. I took a bite, so I could show you the insides (thankfully not as messy as I'd anticipated), and the filling is gooey alright, with a texture I did not expect. I went into this expecting really thin chocolate syrup, but what lies beneath the dark, shiny, surface is more like spoonable hot fudge ice cream topping. 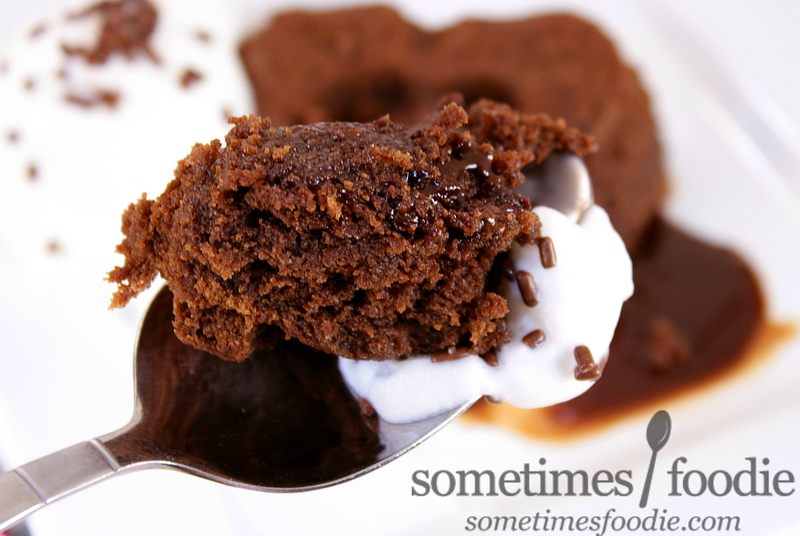 It's thick-ish, stringy, and certainly fudgey. When you get down to the nitty-gritty, these do not taste like actual lava cake, because lava cake is more-so a textural thing. This may have a liquid center, and it is very chocolaty and delicious, but it's more like a chocolate-Gusher. If you're craving the real deal, all you have to do is follow the recipe on the back of the bag. 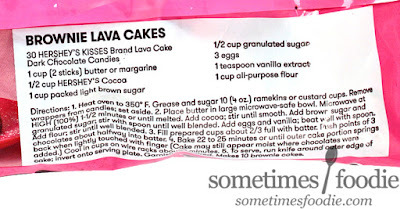 I already had all of these ingredients on-hand, and I was curious to see if the Lava Cake Kiss-inclusion really made much of a difference, so I decided to do a little experiment. 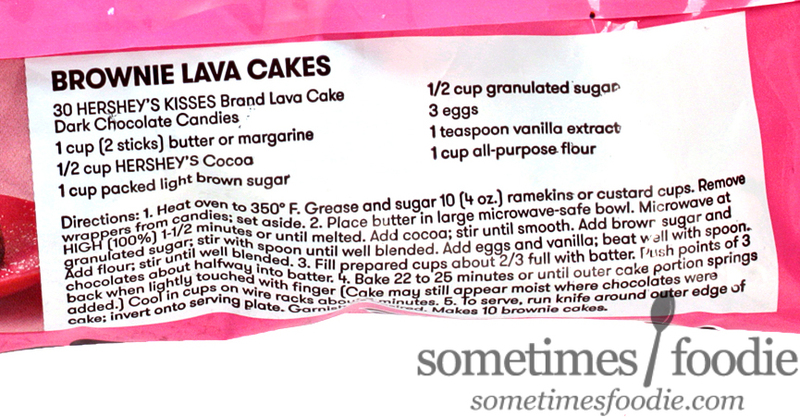 I followed the instructions, but only put kisses in some of the lava cakes, not all. The results? The cakes with kisses created a satisfying chocolate puddle when sliced open, and the centers were really moist, and cake-like, while the exteriors were denser and chewier, like brownies. The cakes without Kiss-centers still had a really moist center, like a cake that was pulled from the oven too soon, but there was absolutely no lava flow. I also found the Kiss-less cakes to be significantly more dense and brownie-like overall. 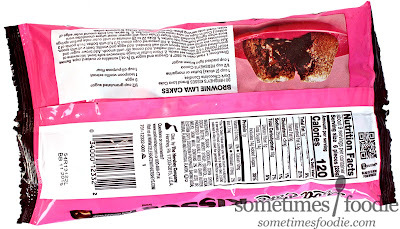 Eating them was like a mixture of amazing chocolaty goodness, and borderline torture. Definitely need a glass of milk for those ones. In the end, the inclusions really did add a wow-factor to the end product, as well as a more enjoyable texture, but all of the cakes, kiss-less or otherwise, were delicious. These were a big hit with my family. 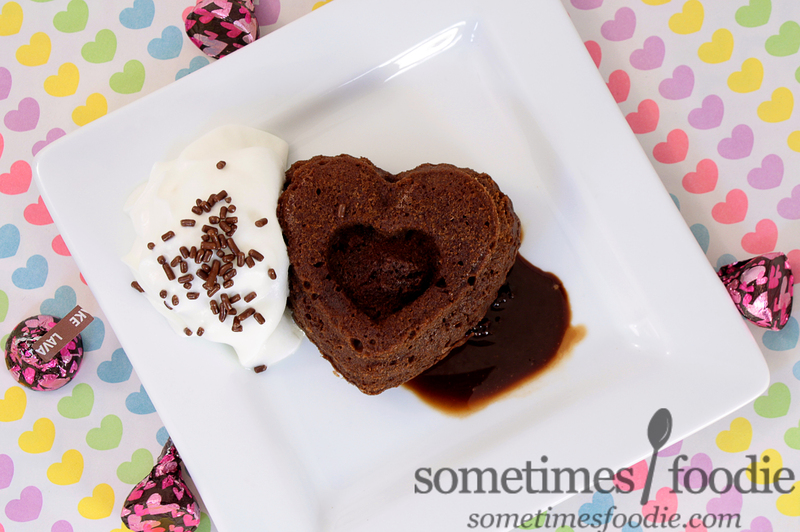 I highly recommend giving this recipe a try with or without the Kisses! Both the Kisses and the recipe are winners! If you're out there scouring the holiday clearance racks, this is one seasonal sweet I recommend picking up!